Hydrogen peroxide was first discovered in the 1800's and over the years this unique solution, consisting of two hydrogen and two oxygen atoms, has become a household name due to its antibacterial and antifungal properties. H2O2 is toxic in high concentrations, however, it is considered safe for use once diluted to safe levels. 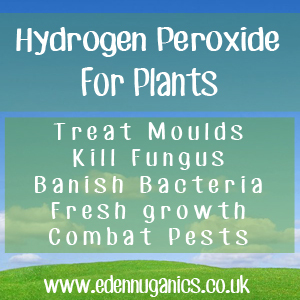 This makes Hydrogen Peroxide perfect for reducing unwanted mould and mildew on your plants. Around the home you may already use Hydrogen Peroxide as a disinfectant. It is able to kill a vast array of harmful bacteria, mould and mildew on contact and is commonly used for cleaning cuts and scrapes. Other uses include: wiping down kitchen surfaces, washing vegetables, and even use as an alternative mouthwash. When H2O2 comes into contact with a surface, it oxidises (releases one of its oxygen atoms) which causes the bubbling effect that many people associate with the product. One of the best ways to use Hydrogen Peroxide for your plants is to use a simple mix of 1 pint water with 4 to 5 tablespoons of food grade hydrogen peroxide. This can be added to a spray bottle and used to mist the affected foliage but it is important to remember to shake the mixture before use. In a matter of days you should notice a reduction of fungus and mould. The oxygen found in H2O2 is also known to help reinvigorate house plants and promote fresh growth. Once the fungus disappears, you can continue to spray the plant weekly to stop it from returning. Hydrogen Peroxide can be used as a general fertilizer, either added to plant water or sprayed directly onto foliage. Many hydroponic gardeners often use peroxide as part of their plants daily feed routine. This is done by adding it to the watering system. H2O2 can also be used to reduce infection of plants after hard pruning. Simply spray on the cut area to stop moulds and bacteria entering the plant. Is your green house living up to its name? Many gardeners suffer from green mildew growing on the inside of the glass. Spraying with hydrogen peroxide regularly will keep all moulds and mildew in check. Hydrogen peroxide is also often used when rooting cuttings. Simply dip your cutting in 3% H2O2 before adding to the soil. This will help to stimulate new growth. Any mould or fungus can be easily treated for next to nothing with this versatile natural liquid. This even includes soil based spores that can be treated by adding H2O2 to the water. Hydrogen peroxide can also be used as a powerful natural weed killer. For this a concentration of 10% hydrogen peroxide is required. Be warned at this concentration H2O2 will kill any plant life is comes into contact with so this should only be used on paths or areas where no other plants are living.